Abstract. We investigate topological properties of skeleton structures of shapes like Voronoi diagrams and straight skeletons. We show that these skeleton structures are homotopy-equivalent to the original shape and discuss the homology of skeletons in arbitrary dimensions. Motivated by applications in NC-machining, we investigate offset curves and their evolution and put it into context of persistent homology. One application is the generalization of maximum inscribed circles. Update: A conference paper on this topic appeared at EuroCG 2018. Skeleton structures of plane shapes are line structures that represent this shape in some sense. They are typically computed as an intermediate data structure for many geometry-flavored algorithms in CAD, GIS, computational biology, mathematical origami, robot-motion and NC-tool path planing, and so forth. In this article we deal with the following two prominent examples of skeletons: The Voronoi diagram and the straight skeleton. We can extend this definition straightforward to polygons with holes or polyhedral shapes4 in any dimension, e.g., a polyhedral torus. 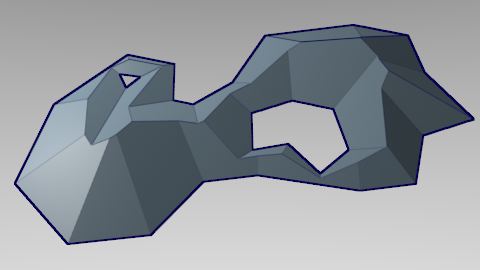 Especially in the CAD/CAM domain generalizations to polygonal shapes where the boundary elements are not only straight-line segments but circular arcs are of particular interest. The Voronoi diagram (blue) of a polygon with holes (black). Straight skeleton. Let denote a polygon in the plane. We consider the edges to move inwards at unit speed in a self-parallel manner. This wavefront propagation causes structural changes in the wavefront: (i) an edge may collapse, vanishes and the neighboring edges become adjacent or (ii) a reflex5 vertex may crash into another part of the wavefront causing the wavefront to split up. Eventually, the wavefront entirely collapsed and vanished entirely. The straight skeleton is the line structure that is traced out by the moving wavefront vertices. Also the straight skeleton tessellates the polygon into cells6 and each cell belongs to an edge of the polygon. The straight skeleton (blue) of a polygon with holes (black). There are various generalizations of straight skeletons: (i) there are different attempts to generalize straight skeletons to three or higher dimensions, (ii) for weighted straight skeletons different speeds of the edges are considered, (iii) different initial wavefront patterns at reflex vertices (or terminal vertices) lead to the so-called linear axis. An overview is given in my thesis. As mentioned, the Voronoi diagram and the straight skeleton of some input captures features of the shape of the input. We can make this statement precise by saying that the Voronoi diagram and straight skeleton of a polygon with holes, , has the same homotopy type as , and in this sense encode the topology of . This can be easily seen as follows. Deformation retraction. The main claim is that there is a deformation retraction of to its Voronoi diagram and straight skeleton, which makes them all homotopy-equivalent. In two dimensions, each straight skeleton cell of a face of is topologically a disk, i.e., it has no holes. A connected part of the boundary of is itself. Let us denote by the boundary of without . Then is also a connected part of the boundary, and hence, there is a deformation retraction of to . We can plug these retractions together in a way that we obtain a deformation retraction of all faces of to their respective and , i.e., we obtain a deformation retraction of to . From this deformation retraction the homotopy-equivalence follows. Positively weighted straight skeletons behave in this respect the same as unweighted straight skeletons, cf. [Bie*15]. For Voronoi diagrams in the plane essentially the same argument applies. However, at reflex vertices we need to refer to the technical detail mentioned above that the two Voronoi edges emanating at are not connected at , they are only geometrically embedded in a way to intersect at . That is, as a topological space could be constructed by gluing together edges at Voronoi nodes, but we do not glue at reflex vertices. Another way to approach the technicality at reflex vertices is the following: We perturb a bit by replacing reflex vertices by tiny circular arcs that are tangential to the edges incident these vertices and receive the shape with . Then and are just perturbed geometric embeddings of the same structure, i.e., , if the structural properties at reflex vertices are taken into account. Finally we can apply the above proof idea for without the technical complications at reflex vertices. Plugging the homotopy-equivalences together we get . In higher dimensions we can do the same7: We retract each Voronoi cell , which is topologically a ball, to , which is topologically a ball one dimension lower that lives on the boundary of , and plug these per-cell retraction together to a deformation retraction of to . By the way, since the medial axis of a polygon with holes, , is the same as the Voronoi diagram only with the edges emanating at reflex vertices removed, we see that . Definition of a skeleton. A idea behind a skeleton seems to be a condensed representation of a shape that is advantageous for further analysis or processing. Following this guidline I would define a skeleton of a polyhedral shape as follows. A skeleton of a polyhedral shape in -dimensional space is a -dimensional deformation retraction of . The Voronoi diagram, the medial axis and the positively weighted straight skeleton are skeletons of polyhedral shapes. Homotopy-equivalent spaces have isomorphic homology groups.8 As a consequence, the homology groups of , and are isomorphic. That means, the Voronoi diagram and the straight skeleton of a simple polygon is a tree. (This is well known, but the above topological argument appears very appealing to me. The argument is essentially based on topological arguments.) Moreover, for each hole that we cut out of the Voronoi diagram (straight skeleton, resp.) gets a “new” cycle, that is, a new “generator cycle” in a free abelian group of “cycles”, namely the Homology group . In three-dimensional space, the Voronoi diagram (or straight skeleton7) of a solid torus with a ball cut out is topologically a sphere with a cycle attached. By Euler–Poincaré the Euler characteristics of and its skeletons are identical. From a topological point of view the straight skeleton and the Voronoi diagram, or skeletons in general, are the same; the difference is of geometric nature. This geometric difference can be seen in the offset curves that belong to each skeleton. Given a polygon with holes, , suppose we would like to inset by some radius such that if we fill out the inset shape with a pen of this radius, we basically get (except that this pen cannot get into corners, for instance). Mathematically speaking, we would like to find a shape (or its boundary curve) such that the Minkowski sum , with a disk of radius centered at the origin, is the largest possible within . In GIS this concept is known as a buffer and in CAD it is known as offsetting. Minkowski-difference. Mathematically speaking, we could ask for the Minkowski difference of with the disk of given radius . The Minkowski difference at a reflex vertex of is formed by a circular arc. Mitered offet curve. When a tool of an NC-milling machine is following this circular arc then this reflex vertex will remain but imperfections of the tool path accuracy will erode this corner. One could remove the circular arc by extending the adjacent line segments and still obtain a tool path that gives the original reflex vertex, i.e., the Minkowski sum with a disk of given radius is still the same. The resulting offset curve is often called mitered offset curve. Two different geometries of offset curves: The Minkowski-difference and the mitered offset curve. One could also replace this one vertex in the offset curve with a few more and obtain something “between” these two extreme cases. This leads to the linear axis9, which is also a skeleton. Computing offset curves “brute force” is a notoriously difficult and error-prone task. If the radius is small then the task is trivial; one just moves the elements of the boundary of inwards by . However, when grows then first only structural (e.g., one element vanishes) but soon topological changes (e.g., the curve splits up) occur. It is worth to consider the evolution of the offset curves for ranging from zero to infinity. The next figure shows first the Minkowski-difference version and then the mitered offset curve. (The third version with the linear axis would lead to the previously mentioned multi-vertex offsets around reflex vertices of .) In order to show the connection to skeleton structures, the figure also depicts the Voronoi diagram and the straight skeleton: The offset curve within a skeleton cell is determined by only. If the skeleton of is already known then the computation of a single offset curve for any given radius is simple, efficient (linear time) and numerically stable. All one has to do is to traverse the skeleton in a certain way and insert element by element of the offset curve. This is exactly what the software packages (Arc)Vroni and Stalgo do. See §1.3.1 in my thesis for further details. The following figure illustrates a more complex (set of) polygons. Computing straight skeletons is P-complete10 and we do not know how to efficiently compute an offset curve (e.g., choose one in the middle of a India) without essentially knowing the skeleton (or something similar to knowing the whole evolution of the offset curves). See the website of Stalgo for its straight skeleton. The skeletons are the “interference patterns” of the wavefront propagation formed by the offset curves. Straight skeletons are originally defined by offset curve (wavefront) propagation. For Voronoi diagrams, this is known as the grass fire model of Voronoi diagrams. (Fun fact: For certain input polygons and metrics the Voronoi diagram and the straight skeleton are actually the same simply because the wavefronts are the same. This observation was exploited in [Hub*14] to generalize straight skeletons to arbitrary dimensions.) To sum up, we can go from skeletons to offset curves and from the evolution of offset curves back to skeletons. They are in a one-to-one correspondence. The geometric difference of those two skeletons, in this sense, can be visualized or manifests in the different geometries of the offset curves. Since the skeletons are homotopy-equivalent, the differences in the evolution of the offset curves are “only” of geometric nature. And still, in the plane we can compute a Voronoi diagram in optimal time, but for straight skeletons the best algorithms are a factor slower and we just hope that may be achievable in theory. Construction of the filtration. Lets make the outline above more precise. First of all, we do not consider the continuous growth of with but only at those finitely many points in time mentioned above, i.e., at those points in time where the boundary of hits a node of the skeleton. We have and therefore . Roof model and super-level set filtration. Another perspective to the construction above is to consider the super-level set filtration of the roof model of the skeleton. We call the roof model of the straight skeleton , and analogously for the Voronoi diagram . That is, we embed the shrinking process of the offset curves into three-space, where the third coordinate is time. The level set of at level is an offset curve and the super-level set is itself. The super-level set filtration is the filtration obtained by the super-level sets with descending level . This is exactly the filtration described above, where the triangulated roof was refined by the level set. In the filtration the simplices in the belt between two consecutive level sets are inserted at the same time (level). The roof model of the straight skeleton. Offset curves correspond to isolines. Click to enlarge. Computing persistence. The standard algorithm for computing persistence is the boundary matrix reduction algorithm by Edelsbrunner and Harrer12. This is the algorithm implemented by libstick. It runs in where is the size of the simplicial complex. The filtration we constructed above is defined on a simplicial complex with simplices which leads to a runtime of . In two dimensions, we can do much better. We already observed that the skeleton tracks the evolution of the offset curves. More precisely, it holds that is homotopy-equivalent to and . (We can see this by applying the same homotopy proof as for , but restricted to .) That means the homology groups of evolve ismorphically to the homology groups of its skeletons. That is, we could consider the skeleton mapped on the roof model. Birth and death of homology classes happens at skeleton nodes.13 We then consider the super-level set filtration on the skeleton. This reduces the size of of the filtration from to . Using the boundary matrix algorithm we can compute persistence in . The below figure illustrates the evolution of the straight-skeleton offset filtration of a polygon with holes . The red circles mark the locations where 0-dimensional homology classes are born (the label contains the order and time of birth). The purple crosses mark the time of death of a 0-dimensional homology class; the grey arrows show which class died by being merged to which class. The orange circles mark the birth of a 1-dimensional homology class. The evolution of the homology classes in the straight-skeleton offset filtration resp. the super-level set filtration of the roof model. An efficient algorithm. In the case of offset filtrations, we can compute peristence in time. The key observation is that there are no local minima in the roof models. Hence, cycles never die. We can always follow the gradient downwards until we hit the boundary of at level . Hence, in oder to compute the 0-th and 1-st persistent homology groups, it suffices to use a union-find data structure whose operations are in . We assume that all nodes have degree three, except for those on the boundary of , which have degree one. (This is not an essential restriction, it only makes the presentation simpler.) We put all nodes of the skeleton in a priority queue and process them with descending level. When a node is processed with all neighboring nodes having a lower level then we make a new component. When a node is processed with exactly one neighbor having higher level then we merge it with the one component. When a node is processed with two neighbors having a higher level, we have two cases: (i) they belong to different components, and we merge the younger one with the older one, i.e., the younger homology class dies. (ii) the nodes belong to the same component, and a 1-dimensional homology class is born, which never dies. The case where all three neighbors would have a higher level cannot happen as this would indicate a local minimum in the roof model. If the skeleton of is given we can compute the persistent homology groups of the offset-curve filtration of in time. Maximum inscribed circle. An illustrative application of the Voronoi diagram (or medial axis) is the computation of the maximum inscribed circle of a polygon with holes in time. The center of the maximum inscribed circle needs to lie on a node of : The maximum inscribed circle has to touch the boundary of at least at three points. These three points belong to different faces of the boundary of and there is no face that is strictly closer to the center. Hence, the center lies on a Voronoi node that is shared (at least) by the cells of the three faces that contain the three points. The distance of a node to its defining faces is called its clearance. The Voronoi diagram has nodes, so we can find the node with the largest clearance in time; it is the center of the maximum inscribed circle. The maximum inscribed circle is centered at a Voronoi node. The notion of “significance” of a peak can be made precise by the persistence of the 0-th dimensional persistent homology classes, which is the difference of the time of birth of a peak and the time of death, i.e., when it is merged with another peak. This is what the so-called persistence diagram illustrates. It illustrates all persistent homology classes as points, where the -coordinate is the birth level and the -coordinate is the death level. The significance is therefore the vertical distance to the main diagonal. The birth level is the radius of the corresponding inscribed circle. The maximum inscribed circle corresponds to the peak that is born first and never dies. The 0-th dimensional persistence diagram of the straight-skeleton offset filtration. Note that the local maximum with a high level but low persistence is not what we look for in the high-speed machining application. These are points in the persistence diagram with high birth level but which are close to the diagonal. We actually look for high-persistence peaks. A related article to this is about detecting peaks in a signal using persistent topology. Bottleneck. Another application of the Voronoi diagram (resp. medial axis) is the detection of bottlenecks in a shape. The basic idea is that if we consider those parts of the Voronoi diagram that belong to the medial axis then a node with two edges incident where the neighboring nodes have higher clearance forms a bottleneck. A bottleneck with a clearance smaller than a value cannot be passed by a disk-shaped tool of radius . A bottleneck by means of nodes with a local minimum w.r.t. clearance. Persistence gives us a bit more information for this application. Consider for instance a polygon with holes , where one hole is moderately close to the outer boundary of . There is a bottleneck by the above definition; a tool cannot pass this bottleneck. However, it may be able to get to the other side by another path. Assume that a 0-dimensional homology class dies lately, i.e., after level . That means one component merges with another, and a Voronoi node belongs to this event. A disk with radius cannot move from the first component to the other. We can only move within the components of the inset shape , but not between components that merge later (i.e, at lower levels) than . The number of components of is the number of points in the persistence diagram in the upper-left quadrant with origin at on the diagonal. Every such point is a component that is born at a level above and death level below . This article deals with algorithms and mathematical formalisms that belong to the field of computational topology. The introduction to this field is the book by Edelsbrunner and Harer12.